Get your plumbing system in top shape so you don’t have any problems in the winter! Fall is upon us and the cooler weather is starting to come! With the first freeze of the season coming up, now is the best time to take a hard look at your plumbing system. There are certain problems that seem to especially turn up during the cold winter months. By checking out your plumbing system now and getting problems fixed now, you can prevent any headaches that may come later on. Here’s what to look out for. How does an ice cold shower in the morning sound? For most people, it sounds like the stuff of their worst nightmares! It is especially bad news during the cold winter, so you should check out your hot water heater for signs of wear that could erupt into something bigger later. 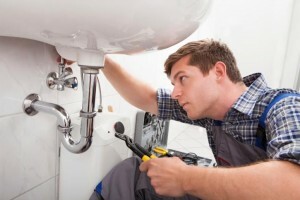 Have your local plumber perform a maintenance check on your water heater and get it in the best condition. Or, consider upgrading to a water heater that’s more energy efficient! It is critical to check your sewage line for backups and the waste level of your septic tank. It is important to have the septic tank pumped and treated before the winter. If you wait until then, the frozen ground and pipes may make the cost of this service higher than if you had it taken care of during the warmer fall months. Do You Have an Outdoor Kitchen Sink Wall? Most people may not know that they even have one! Some homes are designed with the kitchen sink pipes on the outside of a wall in order to allow for the installation of a window. This puts the pipes in a prime place to freeze during the winter. Opening the cabinets in your home is an easy way to allow warm air to flow to the pipes and keep them heated. Making sure your drains and gutters are clean is important. Leaves, debris, and snow can block them up and cause water to pool and freeze, allowing water to leak into your home. Flushing your gutters and drains with a hose now is the best way to avoid this problem. Frozen piping is the most common winter plumbing issue. Identify any pipes that may be exposed and susceptible to freezing during the winter. Once they have been identified, a professional plumber can take steps to insulate them to keep the heat in and prevent this unfortunate problem from happening to you this winter! This entry was posted on Friday, October 14th, 2016 at 4:01 pm. Both comments and pings are currently closed.